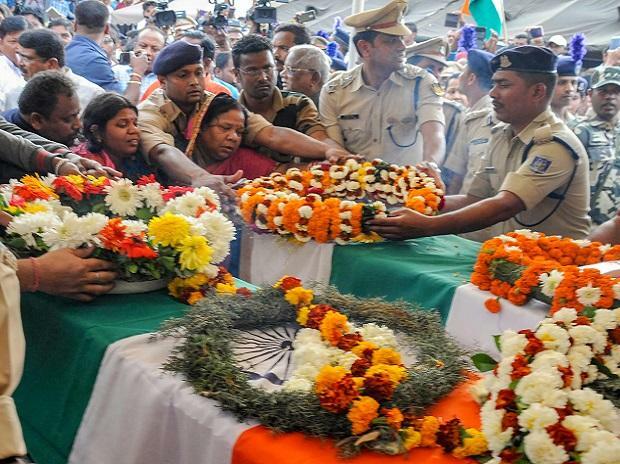 Family members of slain CRPF Jawan Manoj kumar Behera pay their last respects as his mortal remains arrive at Biju Patnaik International Airport, in Bhubaneswar, Saturday, Feb. 16, 2019. Behera lost his life in the Pulwama terror attack. India raised the issue of the Pulwama terror attack, which left 40 CRPF men dead, during bilateral meetings with several countries, including the US, Germany and Russia, at the three-day Munich Security Conference that concluded Sunday, officials said. The 55th Munich Security Conference, which brings together global leaders and security experts from across the world, was attended by India's Deputy National Security Advisor Pankaj Saran. The conference was attended by over 600 delegates and it deliberated at length on a host of security-related issues, including international terrorism. On the sidelines of the conference, Saran held bilateral meetings with representatives of several countries who unequivocally condemned the attack in Jammu and Kashmir's Pulwama district and extended their condolences to the bereaved families. The bilateral meetings, according to the officials, were held with the representatives of the US, Germany, Russia, NATO (North Atlantic Treaty Organisation), Afghanistan, Uzbekistan, Bangladesh, Mongolia, Armenia and Oman. There was widespread support for India's concerns over Pakistan sponsored terrorism on Indian soil, they said. Forty CRPF personnel were killed in one of the deadliest terror attacks in Jammu and Kashmir on Thursday when a Jaish suicide bomber blew a vehicle carrying over 100 kg of explosives near their bus.